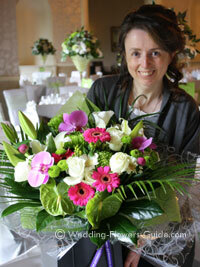 We're Cindy Lymbery (seen in the photo above) and Paul from Pure Botanics Wedding Flowers. Operating out of our floristry workshop in Coventry, UK, we supply wedding flowers to brides in the Warwickshire, Northamptonshire and throughout the Midlands area. We set up this website to provide help, inspiration and advice for brides (and bridegrooms) that are planning their wedding flowers. Cindy is a fully qualified florist with a background in the Arts. Before becoming a wedding florist, Cindy was an Art teacher for 8 years. She graduated with a postgraduate teaching qualification from Cambridge University. She has used her teaching background to run numerous floristry workshops, demonstrations and classes. Paul assists with creative designs and produces many of the wedding centerpieces for brides. He is also responsible for creating this website. We hope you have found our site useful in planning your wedding flowers. Bookmark the site as we are always adding more ideas and photos. If you want to contact us, you can send us a message by clicking here. You can also read comments from brides that we have worked in the past. Want to know how we create wedding bouquets and decorations? Click here for a behind the scenes look at how we create your wedding flowers.